Do you remember your childhood? I’m sure most of us can say we were pretty active as children and looking back we can see how important that was for our continued physical well-being. Without the distractions from electronics and television options, what else could we do but get up and move? We all know that kids should be active, but when kids want to go beyond traditional activities like riding bikes and playing tag, how can we safely challenge them? Check out the exercise descriptions below to get started with your kids. We've also provided a video at the end of the blog that you can use to start family workouts at home. Planking: What better way to challenge your kids than by asking them how long they can hold a plank? Start with elbows and toes on the ground, keep your back straight, abs tight, and all in one straight line. Body should be parallel to the ground. Strengthen core, upper body, and even lower body by starting with a 30-second plank. Squats: Squats are just like sitting down in a chair, so if your kids have nailed that, they can get the hang of a squat. With feet shoulder width apart, slowly bend the knees as if you are sitting down on a box or chair. Make sure the knees don’t extend past the toes when lowering down into the squat position. Aim for 15-20 reps to start. Add a hop at the end for a little extra challenge! Pushups: This is another exercise to test overall body strength. Start from a straight-arm plank position and bending at the elbows, slowly lower the chest to the ground. Make sure the body lowers as one unit versus a form that looks like “the worm." Aim for 15-20 repetitions. Drop your knees to the ground if a modification is needed. Lunges: All legs here! Take a step forward with one leg and slowly lower the back knee down towards the ground. Step forward back to beginning position and switch legs. Make sure the front knee doesn’t extend past your toe, and that the chest stays upright. Shoot for 20 lunges to start, but make sure your form doesn’t weaken as you increase the repetitions. Burpees: The ultimate test! 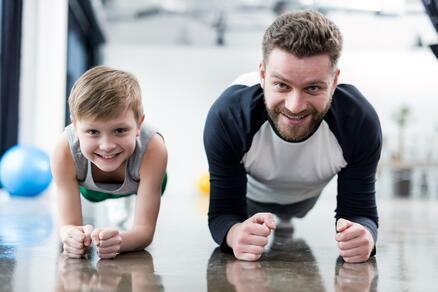 If you really want to challenge your kids and maybe expend some of that extra energy, ask them to do a few burpees. These will really get the heart racing. Start by squatting down, putting the hands on the ground and either hopping or walking the feet back to a high plank position. Add the optional pushup from here and then walk or hop the feet back up towards the hands, followed by a hop straight up in the air. That, my friends, is one burpee. Shoot for 5-10 burpees and see how they feel. Increase repetitions as strength and endurance improve. Repeat all for a challenge! These five exercises are great starting points to get your kids up and moving with you! Repetitions are always great but if you struggle with getting a full set completed, feel free to go for time. Here are some other tips if you're confused about what exercises are appropriate at what age. The key is movement and consistency to build healthy habits for the future!